New OxygenOS Open Beta 7 has been announced for OnePlus 6 and you can download it directly with this tutorial. Just weeks back, the brand released new November 2018 security patch with its Open Beta 6 and now, it has followed it up with yet another release. This time, the changes include a new video enhancer and better roaming capabilities. Further, there are bug-fixes and improvements included as well. For us, the new roaming functionality is quite a major step. Now, users no longer require a local SIM to make use of internet rather they can utilize their OnePlus 6 by paying for a roaming plan. Interested in trying out the new update? Download it for your device right ahead. If you have recently purchased OnePlus 6 or are not accustomed with Open Beta releases, these are basically test firmwares that are made available to users. Generally, within these builds, are new features that will be integrated to the stable channel — after successful testing. For installation, either users can be on an older Open Beta build and update from there or manually download the complete ROM through this guide. For installation, you just need to boot to recovery mode and install ZIP from there. With Open Beta 7, OnePlus is introducing OnePlus Roaming which basically is a virtual SIM functionality that lets users utilize internet without having to put in a local SIM. Further, there is also a new video enhancer which makes colors more vibrant for all video playback. Here is the complete technical specification list down of OxygenOS Open Beta 7 Android 9.0 build for the OnePlus 6. 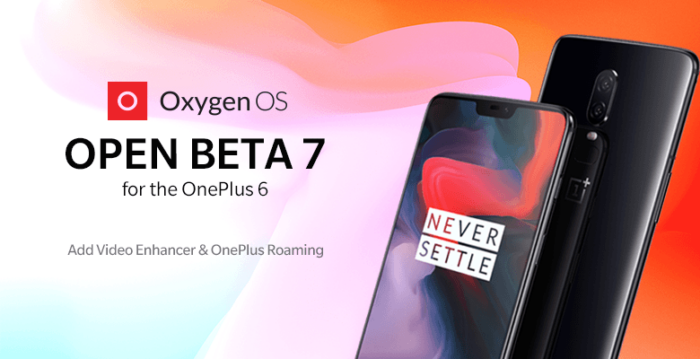 The following download link is the complete and official OxygenOS Open Beta 7 firmware package. As it is officially signed, you can directly install it through the stock recovery of your OnePlus 6. This is an Open Beta build so you would not be able to find it through the stable channel. However, users who are running beta software already, check with OTA (Over-the-air) update system for OnePlus 6 OxygenOS Open Beta 6 Android 9.0 Pie firmware.